Stay on target. 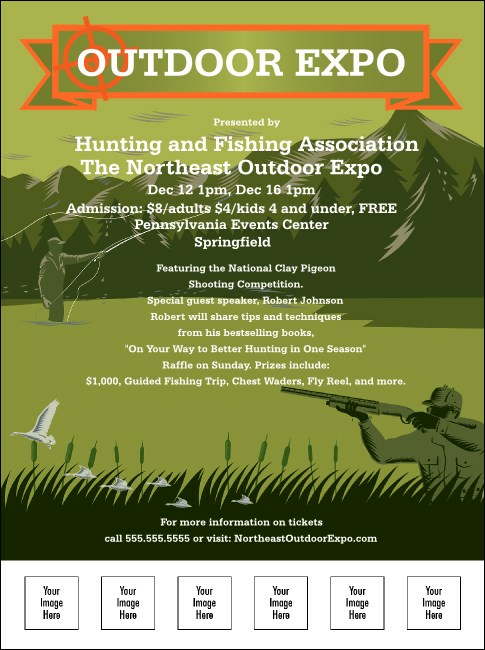 When you're hoping to host a big group of hunting and fishing enthusiasts, the Sportsman's Expo Flyer helps you catch their interests. Whether your vendors have tents, rifles or rods to sell, they'll appreciate the big crowd. Attract it with images of forests, deer and fish. This template has space for six image uploads. Flyer Size: 10.36" x 8.03"
Plan the perfect promotion with TicketPrinting.com.